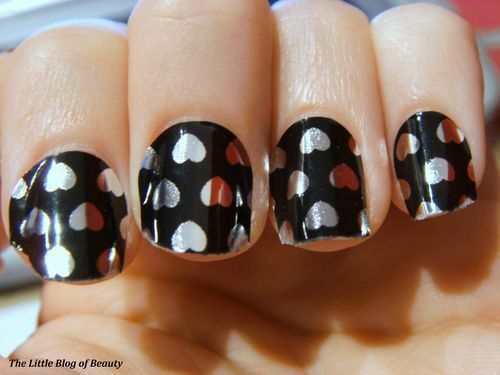 Last night I decided to give my Bad Apple Cosmetics nail wraps a try. I received these in a goody bag I was given when I went to see The Lady Boys of Bangkok. I also received some Bad Apple nail varnishes which I posted about here. 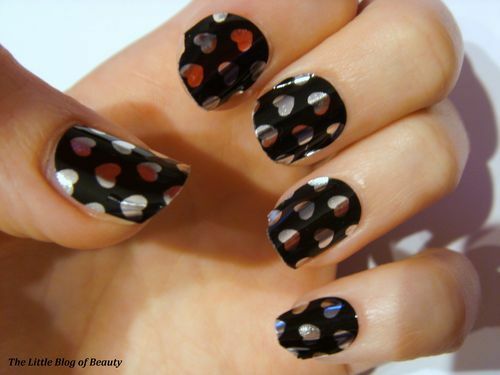 I have tried nail wraps once before when I won a pack in a competition run by the clothes store Oasis. I gave them a try, but I just didn’t really get them. I found trying to trim them really difficult and they looked awful and I decided that they were one product that I wouldn’t buying in the future. 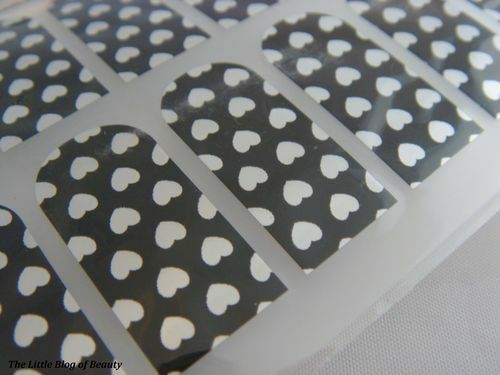 So when I received another pack of nail wraps I thought OK I’ll give them another try. I’m pleased to report that my second attempt was much better and I actually really like these. 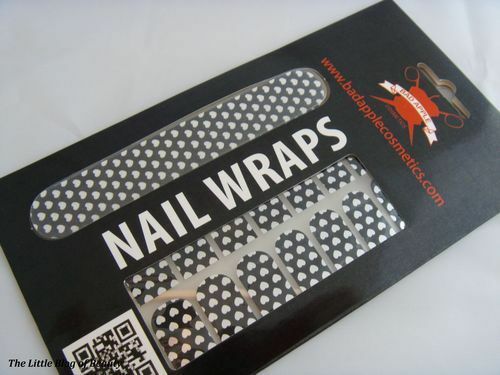 If you’re not sure how to apply nail wraps you simply line the sticker up on your nail, press down and then file off the excess by gently running a nail file down against the end of your nail. This ‘cuts off’ the excess perfectly along the end of your nail. With the Oasis nail wraps I found this part really difficult and I certainly wasn’t left with a nice clean edge, it just looked messy and mangled. But for some reason this was much easier to do with the Bad Apple wraps and on my thumb at least, I was left with a perfect looking nail. The reason I only mention my thumb nail in terms of looking perfect is that I do still have a problem. This being that I apparently have super skinny fingers! I was aware of this already because I wear a ring, which is technically a bit too big for me, but which my mum and brother’s girlfriend can’t even get past their knuckle! I think my ring size for that finger is K or L and I believe many jewellery shops don’t even keep that size in stock, you have to have it made. So my skinny fingers were a problem when it came to the nail wraps. I found one that fitted my thumb nail well, but this was only the third largest one available. After that, despite skipping another size before picking wraps for the rest of my fingers, they were still too big. I couldn’t have gone any smaller for each finger because then I would have run out of sizes before completing all the nails on one hand. 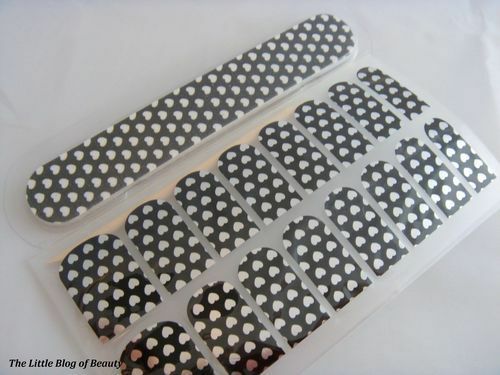 I was really unsure about how long nail wraps would last as they’re basically just stickers stuck on your nails. Well, I have already removed the ones on my fingers because they’re too big and look silly but the one on my thumb I have left on to test staying power. So far I’ve only had this on for 24 hours but I’ve had my hands in water twice and had a shower and there’s no sign of it coming off so far. I have to say I think I may have been converted to nail wraps, however I’m obviously concerned that I may have problems with getting them to fit my skinny fingers. These are also usually quite expensive considering you only get one use out of them but I believe they may last a reasonable amount of time. 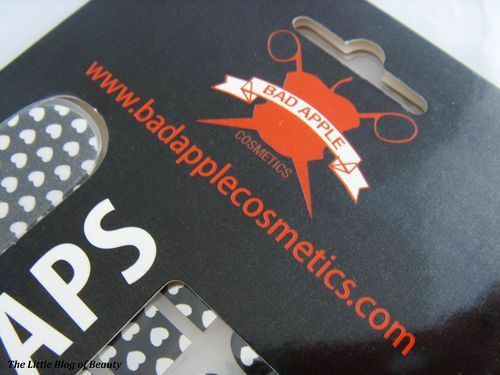 Bad Apple Cosmetics nail wraps are £7.99 and are available from the Bad Apple website.